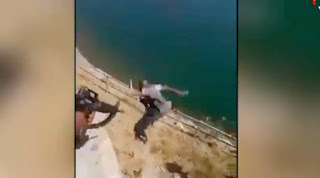 A video has surfaced showing Iraqi Army soldiers beating suspected Islamic State militants and then throwing them off a cliff on the banks of the Tigris River near Mosul. The following video shows Iraqi troops kicking and dragging around detainees. The suspected ISIS fighters are covered in blood from the beatings. They drag one man to the edge of a cliff, where bodies are already scattered below and are being used for target practice. The man is then flung off the ledge. He slams onto the ground just before several soldiers open fire on him.